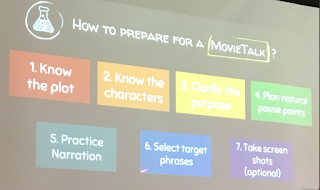 This past weekend at CI:Comprehensible Iowa Conference I went to a really great session on Movie Talk, from Haiyun Lu (@Haiyunlu & @ignitechinese on Twitter). You can tell that Haiyun in a teacher coach, because she did an excellent job explaining, letting us practice the skills on our own, and then elaborating with more detail. 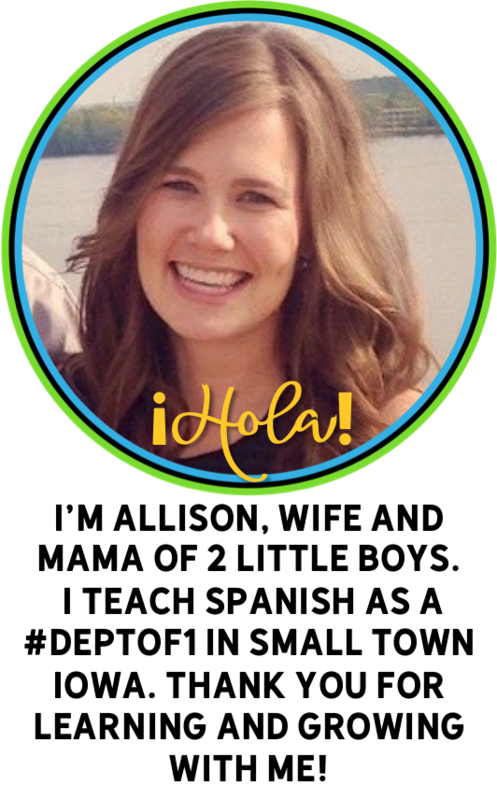 Movie Talk is a technique for language learning developed by Dr. Ashley Hastings. Here are a few more resources on the Movie Talk technique. Basically, the Twitter summary is - Movie Talk is a activity for a CI classroom involving playing a short, muted video clip, while the teacher explains it in COMPREHENSIBLE language. The teacher frequently pauses the clip, asking questions, which circle and repeat the target structures. The goal is not to narrate everything happening, but instead focus on comprehensible language that narrows in on the structures that the teacher wishes to emphasize. My junior high exploratory students LOVE Movie Talks and now I have a better idea of how to make them even more effective in my classes. Where do you find Movie Talk videos? Search your target phrases in Google & see what videos come up! As you can see above preparing for a Movie Talk is all about practicing and making sure that your target language description of the video clip focuses on your target structures. 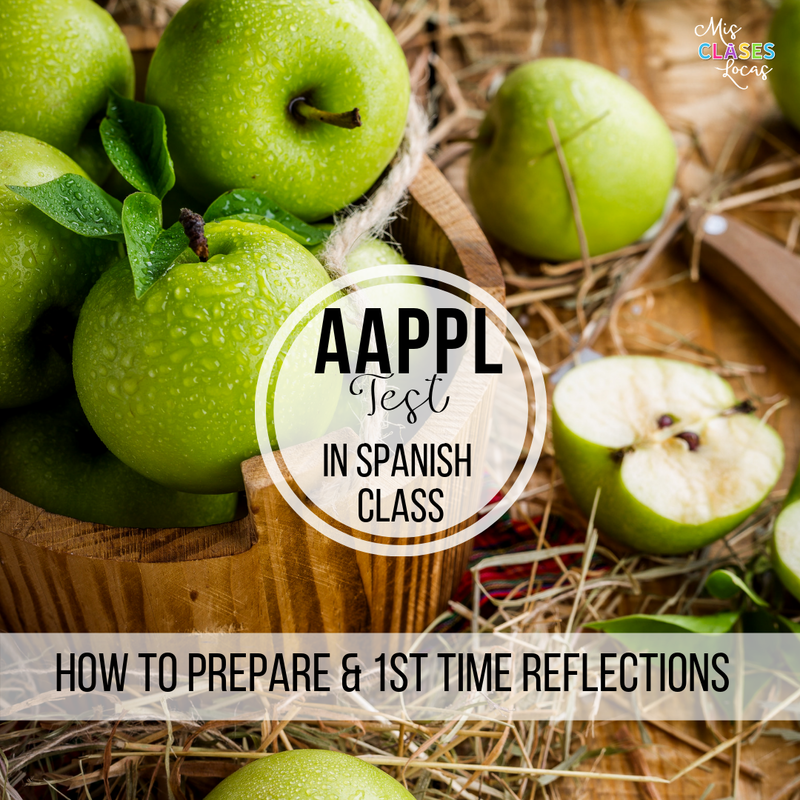 It is very helpful for a newbie to actually write out what you are going to say in the target language, as to not get too bogged down in details, and instead keep your focus on comprehensible language. 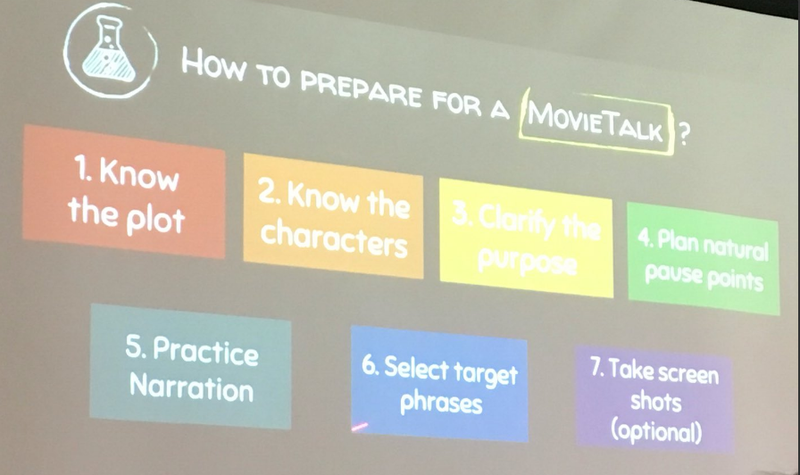 How do you prepare YOUR STUDENTS for a Movie Talk? Explain exactly what you will be doing, watching a short, muted, clip while pausing it A LOT. Prepare students that you will ask questions during the video, and that you are looking for a response like when you story ask. Let them know you will watch the whole video with sound AT THE END. Introduce the target structures. By the time I do a Movie Talk, I have already introduced the structures by writing them on the board, using personalized question and answer, completed a class story, and maybe more. **New idea from Haiyun Lu** Create a short reading to introduce the video, using the target structures, WITHOUT spoiling the ending. While I have used Movie Talk quite a bit this year, I had never done this very helpful step. This would allow students to see the language you will be using while describing, and help give the visual learners some assistance while listening to the movie talk. Haiyun suggests trying to summarize the video in 5 sentences in the target language. We practiced in the session using this cute video. Here is an example process. Give the below reading to novice students, or project and read as a class. Circle and discuss the target structures as they are used in the reading. Notice it does not give a way the ending, but rather gives some suspense to watch to fins out what happens. You could also have screen shots that you show as well to help visually explain. The baby has a cup. The baby walks to and gives the cup to his dad. The dad takes a drink, says "thank you", and gives the cup to the baby. The baby give another cup to the dad and the dad takes another drink. Where is the baby and what is in the cup? El bebé tiene una taza. El bebé camina al papá y le da la taza a su papá. El papá toma, dice “gracias,” y le da la taza al bebé. El bebé le da otra taza al papá y el papá toma. 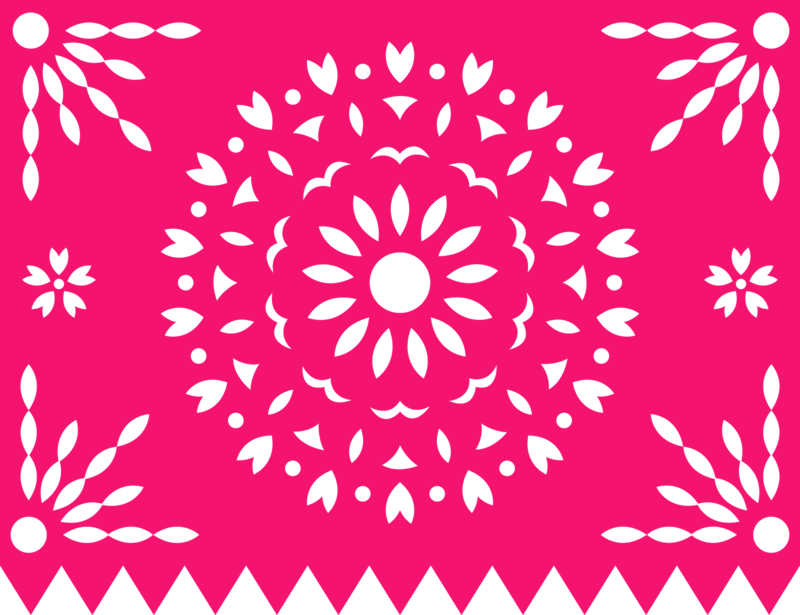 ¿Dónde está el bebé y qué tiene la taza? Play the muted video clip pausing at each scene. Make sure to describe in comprehensible target language, not your thinking language. This means you will focus on the compressible words that your students know, as well as the target structures. Is this a baby or a dad? Does the baby have a cup? What does the cup have? Is the baby walking or running? Make sure to focus on the target structures. You can even have students tally up how many times you use each structure, or have this as a class job for someone who needs a task to stay focused while listening. Once done, show the whole video, un-muted. When I have done Movie Talk in the past, it is usually just that, describing the video and then moving on to the next activity. Here are some ideas of how to use the same video to extend the conversation or complete an assessment. Do a Up/Down Listening Assessment. Have all students put their heads down. Give True/False statements about the video and students put thumb up/down to signify true or false. This is a quick formative way to see if students get it. Put screen shots of video on a piece of paper & have students write out. This could be a mini writing assessment. Cut up little screen shots of video & have students retell video to partner. This could be a mini speaking assessment. Write up a few statements in English as a listening comprehension mini quiz. Ex. Choose the correct answer - The baby has (milk/water) in the cup. 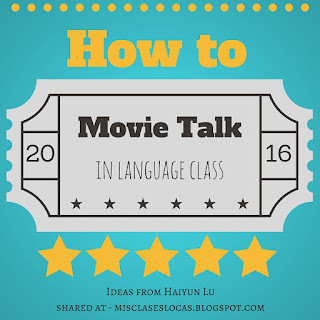 Many thanks to Haiyun Lu for really solidifying how to make Movie Talk work best in a comprehensible input classroom! What are your favorite short videos to use for Movie Talk? Here's a fun link to a website with several videos you could use for MovieTalk. The post is in Spanish, but the videos look great! Thank you so much for this post. I was looking for some information about how to start using it and you're very clear. 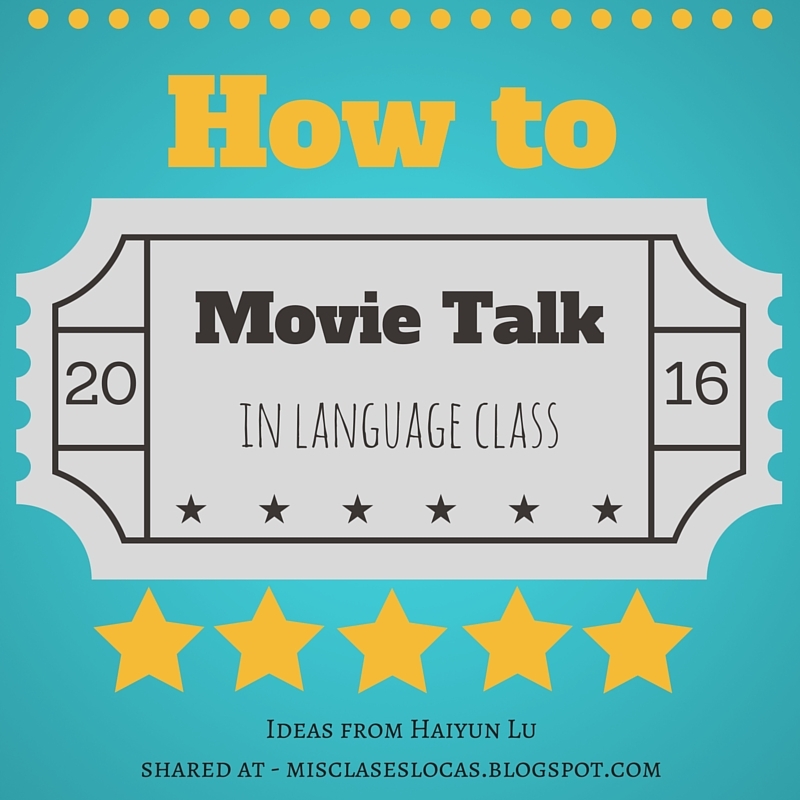 How often do you use movie talk in the classroom? and by the way, the videos are not working. Novel Resources - New Page!